With summer finally creeping in, it’s no surprise why more and more people are considering a beach themed wedding to jumpstart their journey into the world of marriage. Hawaii, the Caribbean islands, Mexico and the Mediterranean coast are all ideal places to hold such an occasion—they all boast of gorgeous beaches, salty air and warm weather. However, just because you don’t have the budget to fly your friends and loved ones to these destinations, doesn’t mean you can’t have your very own beach themed wedding—heck, you can even have one in Toronto in the middle of January. A beach wedding can come in many forms; you don’t really have to limit yourself to a beach location to hold the wedding you’re aiming for. You can easily compensate with accessories, theme variations and decor. 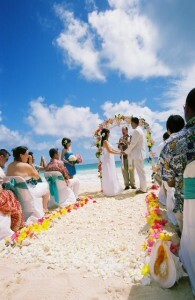 Aside from the obvious beach and coastline location, what comes to your mind when you think about a beach wedding? For example, if you’ve always wanted a wedding reception by the beach under the stars, you can always book an outdoor wedding and pick a clear and starry night to hold your reception. If lighthouses remind you of the beach, you can play around with a lighthouse theme for your wedding. If you can rent an old lighthouse in your vicinity, then by all means, go for it. If that’s not possible, you can always pick a secluded area (if possible near the ocean) and play around with the motif. You can even consider mermaid or fairy themes for your wedding, both of which have proven popular with many brides. A nautical-inspired theme complete with yachting decor, wooden boardwalks and sand can also be done, without having to poke a hole through your wallet.